Home / Dash of Insight / Stock Exchange: Are Interest Rates Impacting Your Trades? The Stock Exchange is all about trading. Each week we do the following: discuss an important issue for traders;highlight several technical trading methods, including current ideas;feature advice from top traders and writers; andprovide a few (minority) reactions from fundamental analysts.We also have some fun. We welcome comments, links, and ideas to help us improve this resource for traders. If you have some ideas, please join in! Review: Are You Trading On Psychological Tilt? Our previous Stock Exchange asked: Are you trading on psychological tilt? We noted that following the harsh Q4 sell-off, many traders have been trading on tilt so far this year. More specifically, they’ve been allowing their psychological disposition to override their objective trade setups and decisions. Our previous Stock Exchange asked: Are you trading on psychological tilt? We noted that following the harsh Q4 sell-off, many traders have been trading on tilt so far this year. More specifically, they’ve been allowing their psychological disposition to override their objective trade setups and decisions. For example, a lot of traders have not participated fully in this year’s rebound because they were anticipating another sell-off based on their psychological biases. 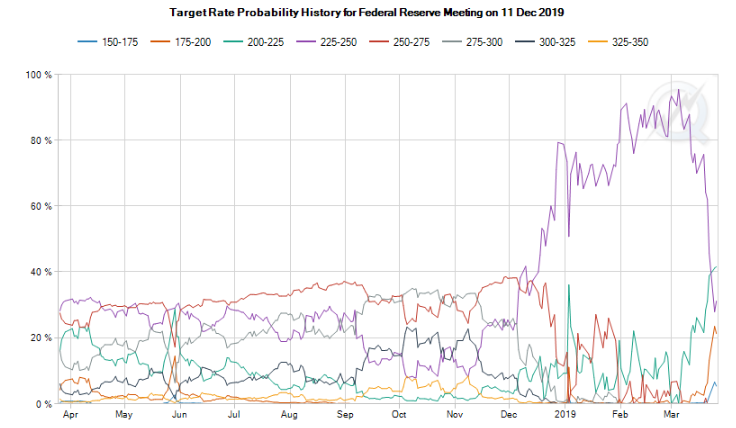 Over the last few months, the Fed has shifted from anticipating multiple interest rate hikes in 2019, to the possibility for zero increases but instead a possible rate cut. For perspective, here is the significant change in interest rate expectations per the Chicago Mercantile Exchange’s Fed Watch tool, which quantifies the significant interest rate expectation changes. The interest rate expectation change indicates a more “dovish” stance from the Fed which is generally good for growth stocks, such as Netflix (NFLX), which we discuss more later in this article. Blue Harbinger: Hey Holmes–nice to hear from you. I know your trades follow a “dip buying” theme, and I certainly see the dip in Ciena. By the way, you do understand Ciena’s business, right? Ciena provides network hardware, software, and services that support the transport, switching, aggregation, service delivery, and management of video, data, and voice traffic on communications networks worldwide. It’s also a higher beta technology sector growth stock, so it’ll likely do well if the Fed’s interest rate “dovishness” continues to exceed market expectations. Here is a look at the Fast Graph, if you are curious. BH: Great–Thanks, Holmes. And for your sake, I hope the Fed continues on with the interest rate “dovishness” for as long as you keep this trade on–which is typically about 6 weeks, per your historical trades. BH: Gee Road Runner, what’s not to like? Netflix has 150 million subscribers, and that number could easily triple. Plus they’ve got incredible pricing power; customers wouldn’t even blink if they raised the price by a dollar and that would flow right to the bottom line. And they can raise it much more than $1. Like I said, what’s not to like? Except maybe the valuation, but even that is not as high as it was last summer, and it seems like growth stocks (like Netflix) have the Fed on their side now. RR: Great. I’m glad we agree. But just to remind you, I typically only hold my trades for 4-weeks. Felix: I don’t have any specific trades to share this week, but I do have a ranking to share. I am a momentum-based technical trading model, and this week I ran the stocks of the S&P 500 through my model, and I’ve ranked the top 20 below. BH: I see you like Kraft Heinz (KHC), Felix. I actually sold some income-generating put options on that one right after it sold off hard in February following its dividend cut announcement. The premium income available in the options market was high because fear and volatility were higher than normal. My strike price was $30, and the options expiration date is April 18th. If the shares get put to me at $30, I’m happy to buy them, and if they don’t then I’m happy to just keep the attractive premium income I generated, no matter what. Felix: That’s all nice, but are you aware that the supposedly iconic brands of Kraft Heinz are dying as consumer preferences and shopping habits are changing (Kraft and Oscar Mayer were just written down by $15.5 billion during the quarter). The company announced a 36% dividend cut, earnings results that fell short of expectations, and an SEC probe related to accounting practices. Yuck! BH: All true, and thanks to fear mongers like you, I generated a healthy amount of income upfront on the trade. And what you’re not recognizing is that Kraft Heinz remains a viable long-term company (even more so than it was prior to the sell off news thanks to the extra cash and adjusted share price following the dividend cut. And if you don’t know, Kraft Heinz has now experienced two consecutive quarters of ORGANIC revenue growth. That means NOT through acquisitions, but rather the business is growing. What is more impressive about the company is they have, by far, some of the best margins in the industry, which means they can finally start focusing on marketing and brand value improvements like their peers do, instead of being only laser focused on cost cutting (which, by the way, they are very good at, thanks to discipline and scale). Oscar: I have some ETF rankings to share. As our resident sector/ETF rotation model, this week I ran our “Comprehensive and Diverse ETF Universe” through my model, and the top 20 are ranked in the following list. You may be interested to know the oil ETF (USO) is at the top of my list. The Fed’s changing interest rate posture has an impact on the economy, and the expectation of future interest rates changes can have a much more immediate impact on the market. There is no shortage of opinions on how the Fed’s interest rate policies will impact the market and the economy, both positively and negatively. Are you letting interest rates impact your trades? How so? Next Stock Exchange: You Risk How Much Per Trade?